Q: Where/what is Nanga Parbat? Tibet has certainly fascinated people all over the world. The hidden land in the most forbidding place on the planet not at either pole. In its day Lost Horrizon made quite a bit of money for its author James Hilton. But the real story of Heinrich Harrer is better than anything a fictional author could have thought up. 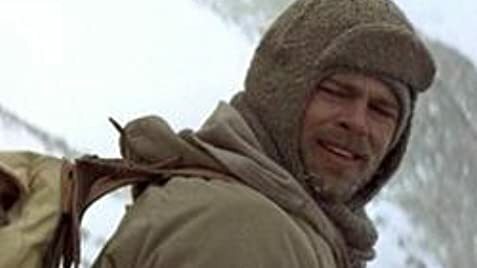 Brad Pitt is Harrer in Seven Years In Tibet and this has become my favorite film of his. Heinrich Harrer, a world famous mountain climber and Austrian national hero goes on an expedition in 1939 to conquer an unclimbed peak in the Himalayas. While he's doing his mountain climbing Germany of which Austria is now part of marches into Poland and World War II begins. Harrer and his party are interred as enemy aliens. In 1942 Harrer escaped and he and a friend played by David Thewlis make their way into Tibet. The rest of the film is the seven years he spent there, centered around the unique friendship he formed with the child ruler of Tibet, the Dalai Lama. This in fact is the same Dalai Lama who today is possibly the world's greatest and non-aligned apostle of the gospel of peace. Brad Pitt is never better in the film than he is with the three child actors who play the Dalai Lama at various stages of his life. The physical hardship that he and Thewlis endure just getting into Tibet is adventure enough. But the spiritual journey he undergoes in his time there makes this one of the most unique adventure stories of the last century. One thing I liked about Seven Years in Tibet is that no effort was made to cover up Harrer's Nazi background. In an alternate universe one can speculate on what might have happened to him had he actually had to serve in the army in World War II. His internment saved him from possibly being involved any number of atrocities. God, fate, some kind of higher power saved him for something wonderful. The cinematography is breathtaking, this film had an incredible number of locations. Note that it was shot in British Columbia, in Argentina with the Andes serving as the Himalayas, Austria and even some establishing footage was shot in Tibet itself on the sly. Tibet's status is unique unto the world. It has been part of China since the Ming dynasty. It's referred to properly as the autonomous region of Tibet. China has given it autonomy in varying degrees over the past several centuries, it's never been truly independent. The Communist regime back in the days of Mao Tse-tung brutally asserted it's sovereignty a few times, most notably in late fifties when the Dalai Lama was forced to flee Tibet and live in Northern India where he resides to this day. That is when he's not traveling the world as it's foremost advocate of non-violence. It is sad that this film did not get more box office than it did. Brad Pitt, David Thewlis, director Jean Jacques Arnaud are all persona non grata in the People's Republic of China for making this film. Quite a market indeed to be shut out of for a stand for humanity. It's to be hoped that one day the Tibetans will be free. Until then they have their unique brand of Buddhism to sustain them and this wonderful film to tell their story.